The Affordable Care Act (ACA) requires larger employers to provide health coverage to employees working 30 hours a week or more, or pay a penalty. S. 1188, the Forty Hours is Full Time Act of 2013, sponsored by Senators Susan Collins (R-ME) and Joe Donnelly (D-IN), would raise the threshold from 30 hours a week to 40.1 This brief analyzes the impact of the proposed act on workers’ hours and the federal budget. We find that the act would result in reductions in work hours for significant numbers of American workers, fewer workers obtaining job-based coverage, and an increase in the federal deficit of more than $140 billion over a ten-year budget window. Under the ACA, large firms-those with 50 or more full-time equivalent workers-that do not offer affordable health coverage with minimum value to employees working 30 hours a week or more will pay a penalty to the federal government if at least one of their workers enrolls in subsidized coverage through one of the marketplaces.2 Implementation of the employer responsibility provision was postponed to January 2015. The employer responsibility provision in the ACA serves several important functions. The ACA was designed to build on the current system of job-based coverage in the United States. Individuals with coverage through their jobs would keep that coverage, while people without access to job-based coverage would be protected from discrimination based on health status and would have access to affordable healthcare options through the new marketplaces. Low- and moderate-income families would have access to subsidies through the marketplaces or an expanded Medicaid program. The employer responsibility requirement reduces firms’ incentive to drop health care coverage in response to the availability of subsidized coverage and broader eligibility of Medicaid. Those firms that choose not to offer coverage would pay a penalty to the federal government which would contribute to the costs of federal healthcare subsidies. The authors of the Forty Hours is Full Time Act argue that a higher threshold is needed because employers will cut employees’ hours in order to avoid either providing health insurance or paying a penalty for some workers.3 Under the current provisions in the ACA, we would expect reductions in work hours to be largely restricted to employees not currently receiving coverage through their employer who work just over the 30-hour a week threshold and have family income that makes them eligible for marketplace subsidies or Medicaid. Restructuring work to reduce hours below 30 hours a week for jobs that now typically have hours substantially above 30 hours a week would be costly. Part-time work is associated with greater turnover. Employers would face increased costs for hiring, training, and supervision, as well as an increase in costs for unemployment insurance. The Forty Hours is Full Time Act would make it nearly costless for employers to reduce work hours to avoid the penalty given the ease of moving from a 40-hour to 39-hour work schedule. 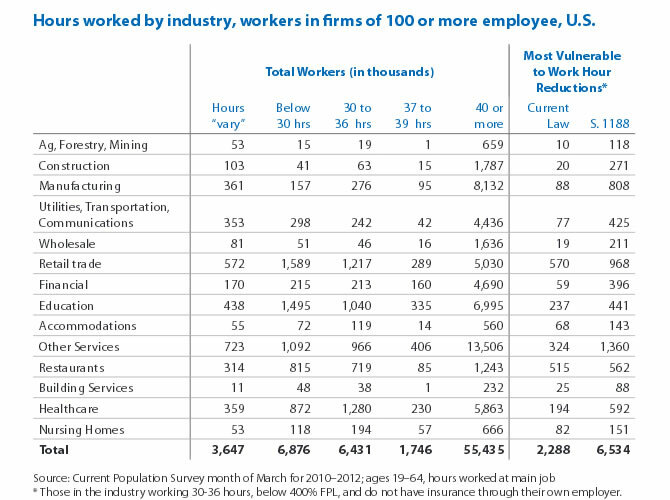 While an estimated 6.4 million employees in firms of 100 employees or more work between 30 and 36 hours a week, 55.4 million work 40 hours a week or more.4 Those most vulnerable to work hour reductions are employees who do not currently have access to job-based coverage, and have family incomes under 400 percent of the federal poverty level and would therefore be eligible for subsidies. We estimate that 6.5 million Americans are in firms of 100 workers or more, work 40 hours or more a week, have incomes under 400 percent of the federal poverty level, and do not have job-based coverage through their employer and so would be vulnerable to reduced work hours under the proposed act. This represesents 5.6 percent of the United States workforce. To the degree that greater numbers of employers drop coverage as a result of the proposed act, the number of employees vulnerable to work hour reductions would increase correspondingly. Since employers can easily reduce work hours from 40 to 39 hours a week, S. 1188 would effectively eliminate the employer requirement which would thus no longer serve as a disincentive to employers dropping coverage in response to the new federal programs. Along with increasing the number of employees who would have their job-based coverage dropped, the act would also reduce the number of firms that would have begun offering coverage as a result of the employer responsibility provisions in the law. In July, the Congressional Budget Office (CBO) estimated that delaying implementation of the employer requirement would result in 1 million fewer individuals with job-based coverage in 2014, half of whom would be uninsured and half enrolled in subsidized coverage, Medicaid, or a state Children’s Health Insurance Program.6A policy that makes the employer requirement effectively non-binding on a permanent basis would result in a greater reduction in job-based coverage. The most recent estimate from the CBO for employer penalty payments is $140 billion between 2014 and 2023. Since most employers could easily avoid payment of this penalty if the hours threshold were increased to 40, it is reasonable to assume that very little, if any, of this projected revenue would materialize were S. 1188 to be enacted. In addition to the direct revenue loss from the proposed act, there would be the additional cost associated with a shift of individuals from job-based coverage into subsidized coverage through the marketplaces or Medicaid. The CBO estimated that approximately half a million more individuals will get coverage through the marketplaces or enroll in Medicaid or CHIP in 2014 due to the Administration’s delay in enforcing the employer responsibility requirements, and it suggested that a permanent change in the rules would have a larger overall impact. In their estimate of the effects of delaying the requirement for one year, the CBO projected $10 billion in lost revenue, $3 billion in greater costs for subsidies and Medicaid, which would be offset by $1 billion in higher tax revenue as a result of increased compensation, for a net cost of $12 billion a year. Costs would rise considerably over the current budget baseline in the later years. The Forty Hours is Full Time Act would effectively eliminate the employer requirements under the Affordable Care Act. It would result in a reduction of employer-sponsored insurance and a shift of costs from employers onto the federal government. Lost revenue alone would be as much as $140 billion by 2023. Added to this would be the costs of additional subsidies and greater enrollment in Medicaid. Finally, S. 1188 would result in lost work hours for an estimated 6.5 million workers, nearly three times the number anticipated under current law. Ken Jacobs is the chair of the University of California, Berkeley, Center for Labor Research and Education. Dave Graham-Squire is a research associate at the University of California, Berkeley, Center for Labor Research and Education. Draft IRS regulations establish 130 hours a month as the standard measure and allow for look-back periods of up to 12 months to determine full- or part-time status. Federal Register Volume 78, Number 1, pages 218-253, January 3, 2013. While the penalty applies to firms with more than 50 full-time equivalent employees, due to data limitations we restrict our analysis to workers in firms with more than 100 total employees. Thus, the table may slightly understate the number of potentially affected workers. Buchmueller, Thomas, Colleen Carey, and Helen G. Levy. Will Employers Drop Health Insurance Coverage Because Of The Affordable Care Act? Health Affairs, September 2013, 32:91522-1530. City and County of San Francisco Office of Labor Standards Enforcement. Health Care Security Ordinance (HCSO). http://sfgsa.org/index.aspx?page=418. For a discussion of the economic impacts of the law see: Colla, Carrie, Will Dow, and Arindrajit Dube. San Francisco’s ‘Pay Or Play’ Employer Mandate Expanded Private Coverage by Local Firms and a Public Care Program, Health Affairs, January 2013, 32:169-77. The Center for Labor Research and Education (Labor Center) is a public service project of the UC Berkeley Institute for Research on Labor and Employment that links academic resources with working people. Since 1964, the Labor Center has produced research, trainings, and curricula that deepen understanding of employment conditions and develop diverse new generations of leaders. The views expressed in this policy brief are those of the authors and do not necessarily represent the Regents of the University of California, the UC Berkeley Institute for Research on Labor and Employment, The California Endowment, or collaborating organizations or funders.